Forerunners to modern Brussels sprouts were likely cultivated in ancient Rome. Brussels sprouts as we now know them were grown possibly as early as the 13th century in what is now Belgium. The first written reference dates to 1587. During the 16th century, they enjoyed a popularity in the southern Netherlands that eventually spread throughout the cooler parts of Northern Europe. Brussels sprouts grow in heat ranges of 45-75°F, with highest yields at 59-64°F. Fields are ready for harvest 90 to 180 days after planting. The edible sprouts grow like buds in helical patterns along the side of long, thick stalks of about 60 to 120 cm (24 to 47 in) in height, maturing over several weeks from the lower to the upper part of the stalk. Sprouts may be picked by hand into baskets, in which case several harvests are made of five to 15 sprouts at a time or by cutting the entire stalk at once for processing, or by mechanical harvester, depending on variety. Each stalk can produce 1.1 to 1.4 kg (2.4 to 3.1 lb), although the commercial yield is about 900 g (2.0 lb) per stalk. In the home garden, "sprouts are sweetest after a good, stiff frost". Brussels sprouts are a cultivar of the same species that includes cabbage, collard greens, broccoli, kale, and kohlrabi; they are cruciferous (they belong to the Brassicaceae family; old name Cruciferae). They contain good amounts of vitamin A, vitamin C, folic acid and dietary fiber. Moreover, they are believed to protect against colon cancer, because they contain sinigrin. Although they contain compounds such as goitrin that can act as goitrogens and interfere with thyroid hormone production, realistic amounts in the diet do not seem to have any effect on the function of the thyroid gland in humans. 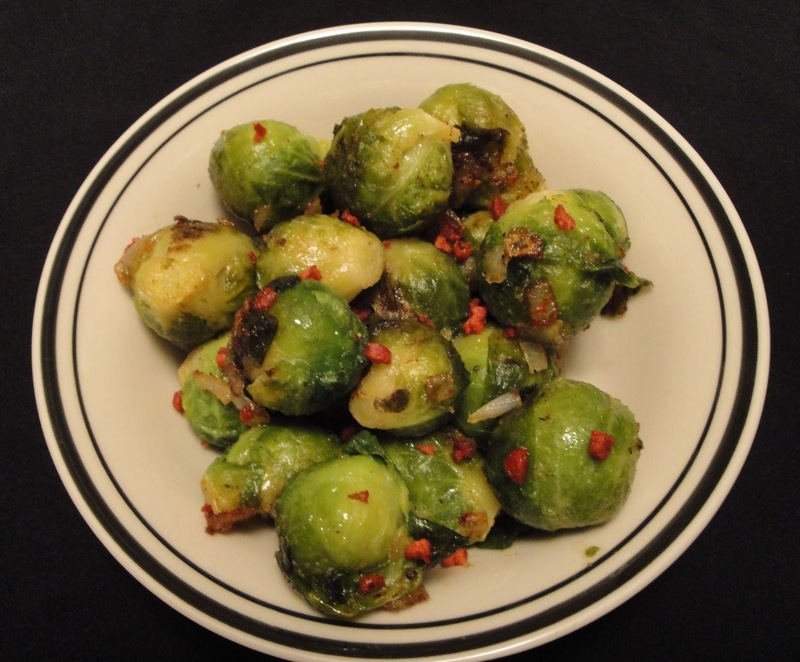 Brussels sprout per-capita consumption in North America has increased nearly 40% since 1997. In skillet, heat oil over medium high heat. Add onions to the skillet and saute for 2 minutes. Add Brussels sprouts. Season with salt, pepper, garlic powder and onion powder. Cook Brussels sprouts 3 to 4 minutes, begin to soften. Add broth and bring to boil, cover and reduce heat to medium low heat. Cook about 8 to 10 minutes, until tender. Transfer Brussels sprouts to a serving dish with a slotted spoon and top with bacon bits. Enjoy! Looks good. Going to try this. Everything is good with bacon. I loves brussel sprouts and i loves bacon.....a good combination.